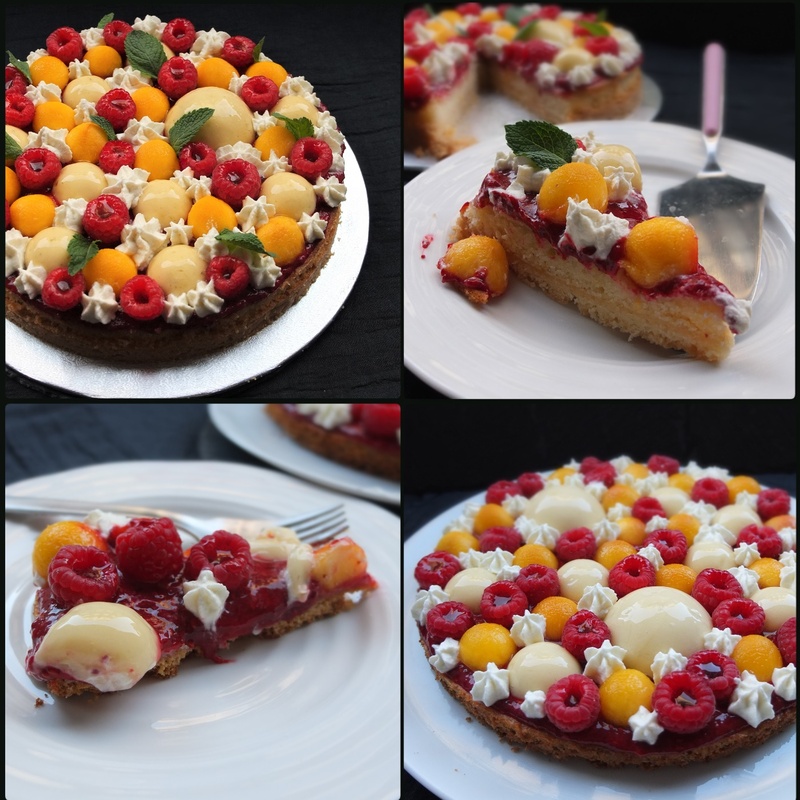 Raspberry, lemon and peach Fantastik tart recipe! Healthier gluten-free, low-sugar with refined options! And what is Michalak’s tarte Fantastik? What first excited me about this tart was the idea of baking the shortbread base lightly then returning to the oven topped with a sponge layer. Nice huh? Have a look at two earlier prototypes below. They were delicious but the first was a bit cake-like and heavy with rather thick layers. Prototype 2 had overly thin sponge but a lovely crisp base. 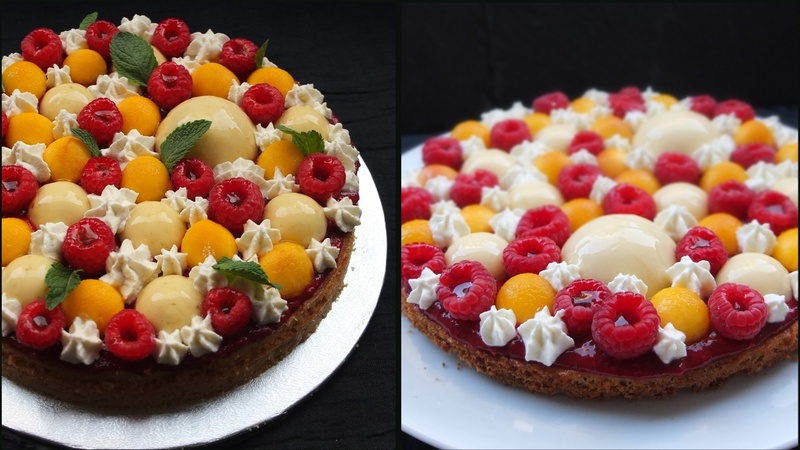 In the final version (see ealier photo) both layers are slim so the fruit and other toppings shine. 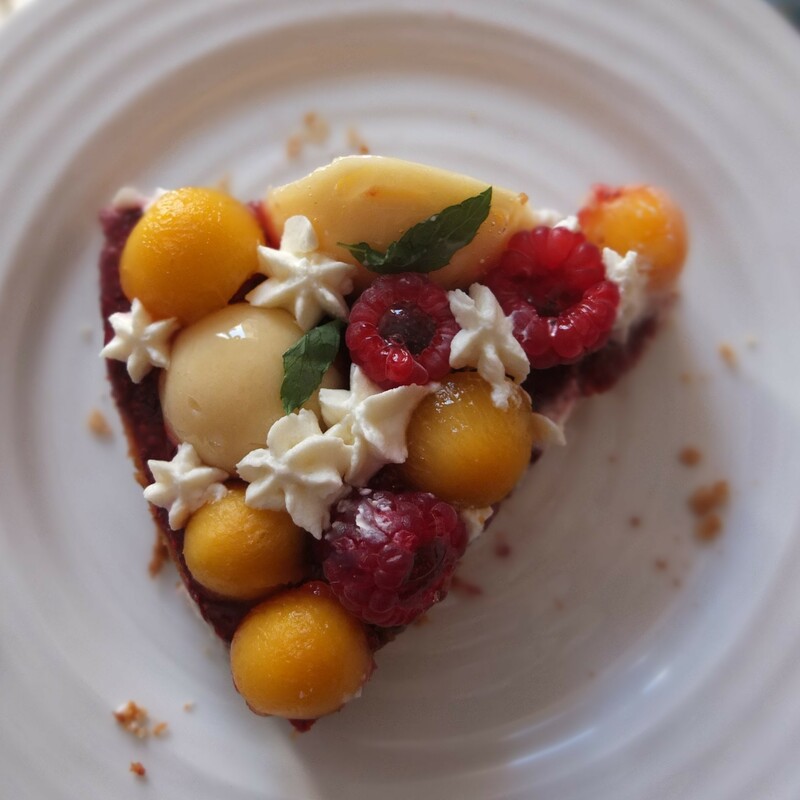 The tastiest seasonal fruit help make this tart special and fresh so I tried fitting lots of raspberries and peach balls on top! 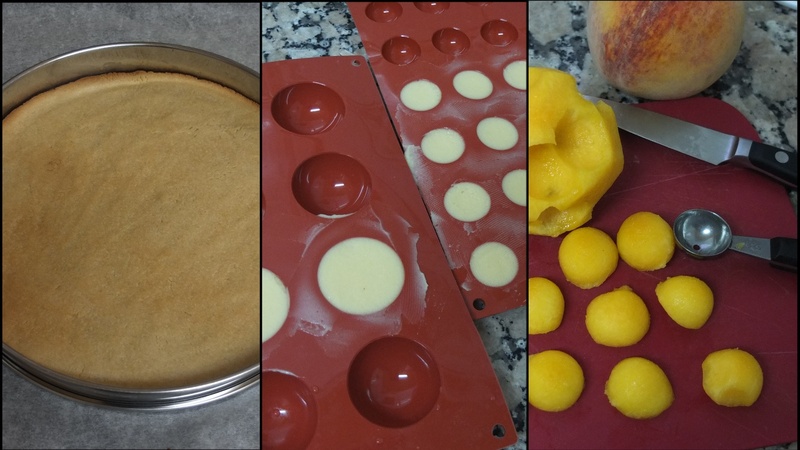 Previous day – lemon-lime domes: 10-15 mins work + 20 mins infusing and 10 mins cooling; raspberry jam: 8-10 mins work; pastry: 10-15 mins work. Total: all elements can be prepared together within 1 hour (28-45 mins work). 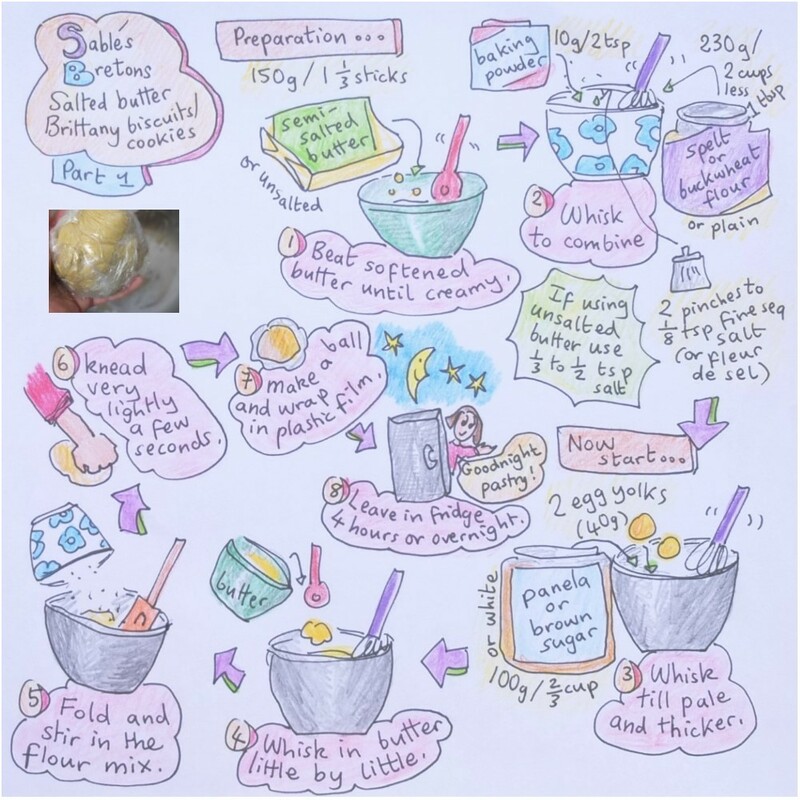 On the day – baking the pastry: 5-10 mins work; 9-11 mins baking. While pastry’s baking make lemon sponge: 15-20 mins work; 13-18 mins baking. 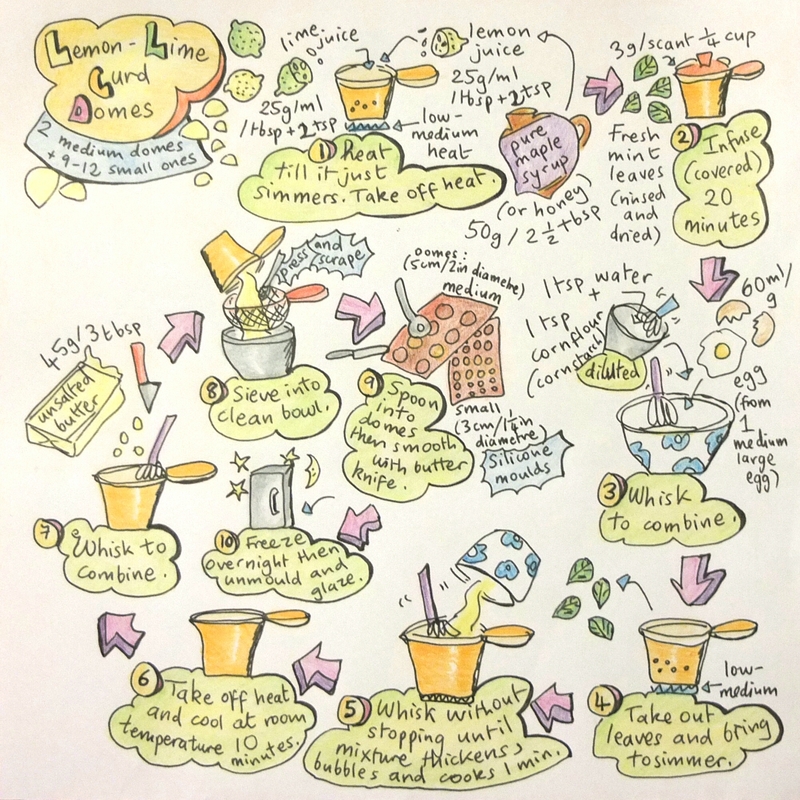 While sponge’s baking make syrup: 5 mins work; 10-15 mins infusing; 2 mins brushing. Waiting: 1-2 hour cooling. Glaze: 5-10 mins work; thickening around 15 mins. Chantilly cream: 5-10 mins. Final assembly: 30-40 mins work. Total: 1 hr 10 mins to 1 hour 50 mins work within about 4 hours. 20cm/8in tart ring (or use a traditional tart mould but it could be difficult to unmould). 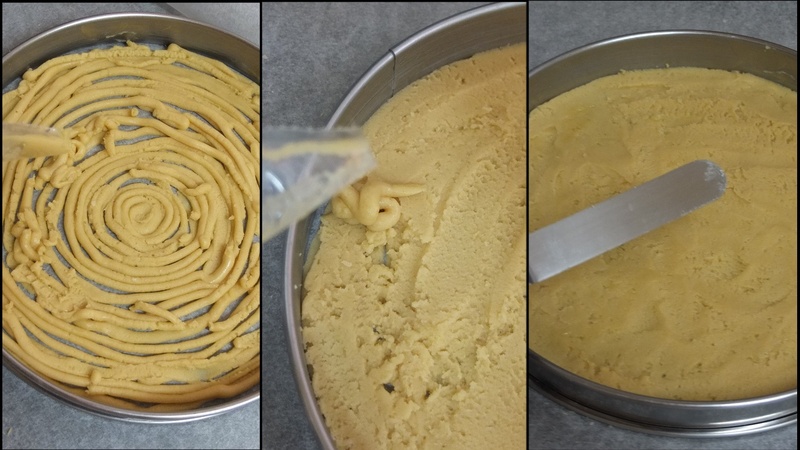 Silicone dome moulds, small (24-dome mould, 3cm/1 and 1/4in diametre domes) and medium (8-dome mould, 5cm/2in diametre domes) – can be bought online at Amazon. Small melon ball scooper (or cut peach cubes). Disposable piping bag and star nozzle. 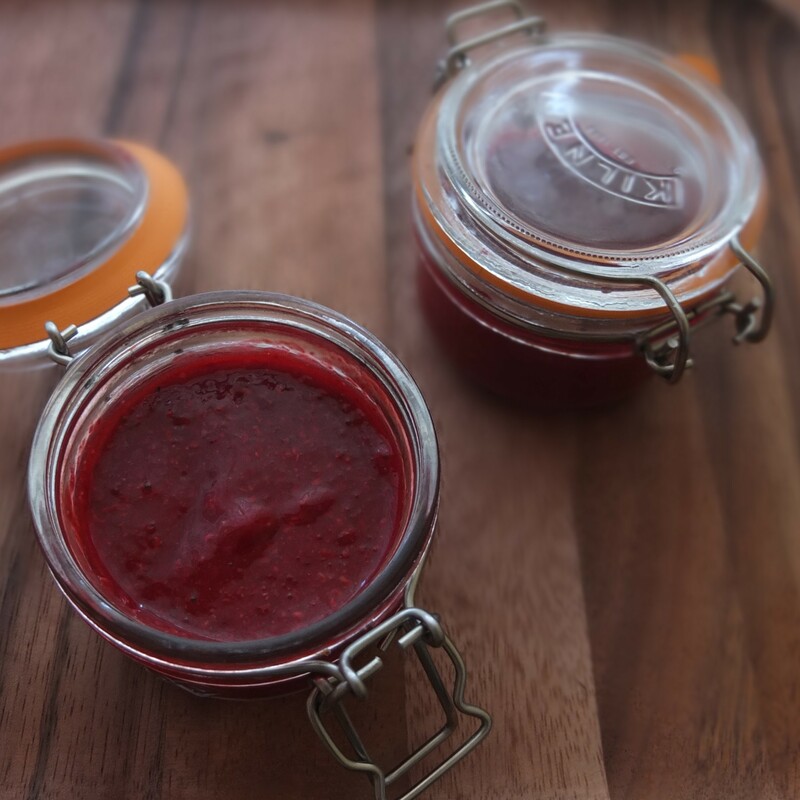 You need about 130-150g/half a cup plus 1 or 2 tablespoons easy raspberry chia jam – recipe here from the basics section (halve the quantities) or shop-bought raspberry jam. 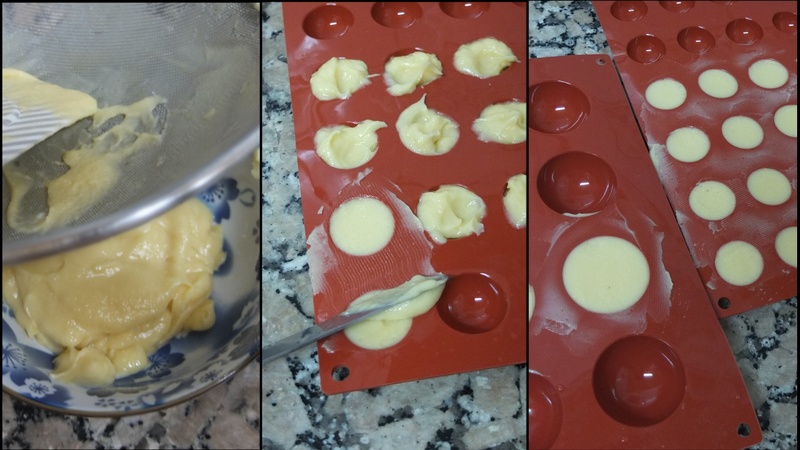 Make a ball of sablé pastry following the illustrated recipe but with the quantities shown above. For detailed instructions see sablés bretons in my basics section here. Use a tart ring lightly greased with butter inside and placed on a baking tray lined with baking paper. Option A (when dough’s too thick to pipe): rest the ball of shortbread in the fridge overnight. Next day sprinkle little pieces in the tart ring then spread to an even layer with the back of a metal tablespoon or offset spatula. Chill in the fridge 2 hours. Option B: once the dough’s made immediately put in a disposable piping bag and cut off a small tip. Pipe very thin concentric circles of the pastry in the tart ring then spread to make an even layer with the back of a metal tablespoon or offset spatula. Chill in the fridge overnight. While the shortbread’s baking (or start 10-15 mins before) prepare the lemon sponge. Bake the shortbread base 9-15 mins until light golden in colour (it goes back in the oven covered with sponge) or until a medium brown colour so it will look almost overdone later but is delicious and crispy (I prefer this, as in thin prototype 2). Next time I’m leaving it around 13-15 mins and not 10-12. Timings depend on your oven and taste. Take out of oven, keeping on the tray. Lower the oven temperature to 160°C/320°F (fan/convection oven) or 180°C/350°F (static/non-convection) to bake the sponge that will cover this base. 60g/1/4 cup + 3 tsp ground xylitol (to texture a bit finer than caster sugar, almost powdered). Or use caster/superfine sugar. Whisk the flour, cornflour, baking powder and salt together in a small bowl to combine. Whisk the egg, xylitol (or sugar) and lemon zest in a medium bowl over a bain marie (1cm/1/3in slightly simmering water in a saucepan). You can also whisk it cold but it’s faster with heat. Whisk until pale and doubled in size. Don’t let it get too hot (maximum 45ºcelsius). Take off heat and whisk until the bottom of the bowl feels cool to touch. Whisk in the greek yoghurt and lemon juice. Slowly stir in the flour with the whisk until just combined. Don’t overwork. Slowly stir in the oil until just combined. Pour over the shortbread base in the tart ring. Spread to an even layer with the back of a metal tablespoon or small offset spatula. Bake 13-20 minutes until golden – an inserted skewer should come out clean. While the sponge is baking make the lemon-mint syrup. Heat the water, lemon and maple syrup in a small saucepan until it just simmers. Take off the heat and add the mint leaves. Cover to infuse 10 mins or more. When the sponge is out of the oven immediately slide it (with the baking paper) off the baking tray and onto a wire rack. Slide a sharp knife around the sides to help loosen and take the ring off. Leave to cool at room temperature 1-2 hours before decorating. simple glaze – shop-bought or use my mirror glaze basics recipe here, making half the quantity: 33g (2tbsp + 1 and 1/2 tsp) caster/superfine sugar, 33g/ml mineral water and half a sheet gelatine (1g). While it’s thickening in the fridge do step 1 and the cream. Unmould the domes and place in the freezer. Set up a wire rack over a clean baking tray. Take out 5 domes, place on the rack and spoon the glaze over them. Make sure the glaze is runny enough to cover them evenly with no lumps. If it’s too gloopy and thick then heat the glaze a little over the stove or bain marie until it’s runny again (stir – don’t whisk). Immediately lift each one carefully with a small offset spatula (or similar utensil) and place on your tart. Repeat step 4 until all your domes are glazed, scraping out the glaze from the baking tray to re-use and spoon over the domes when needed. Peel 2 large yellow peaches and scoop out semi-spheres with a small scooper. They can be all the same size or varied (using both scooper ends). Soak in the remaining lemon mint syrup. 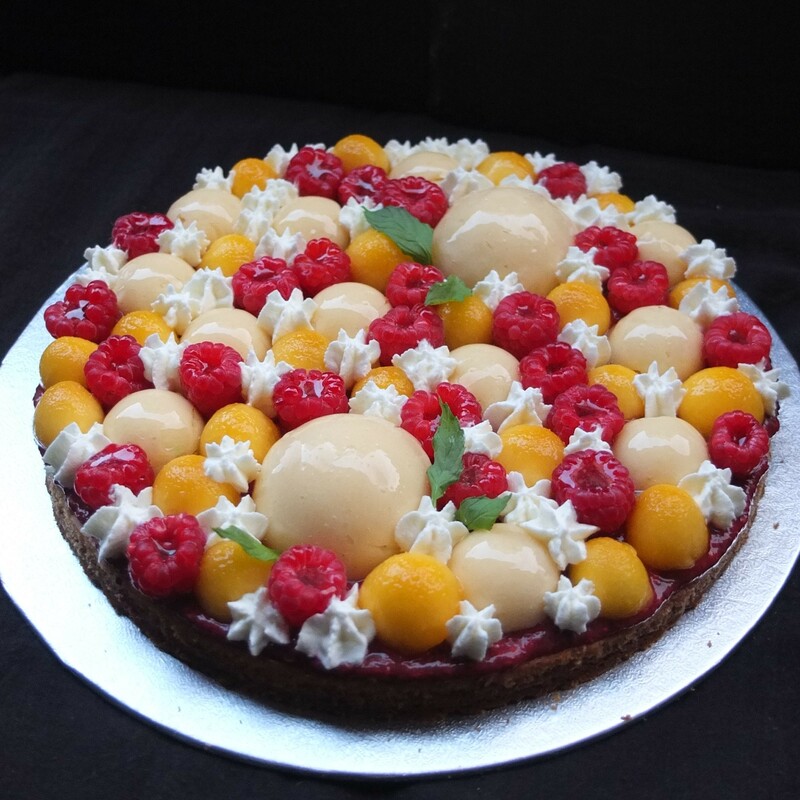 Place the fresh raspberries on the tart. Fill them with drops of leftover glaze (using the small scooper end). 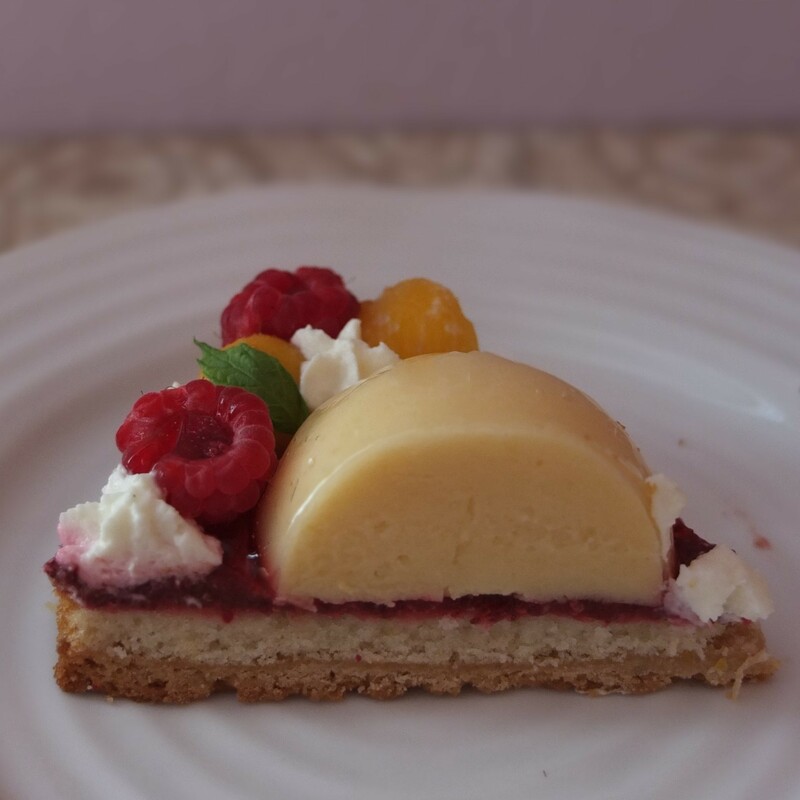 Pipe chantilly cream stars to fill gaps between the fruit and domes. Decorate with mint leaves if you like. Store in airtight tupperware in the fridge and eat within 3 days – it’s best during the first two days and the third it’s fine but softer. 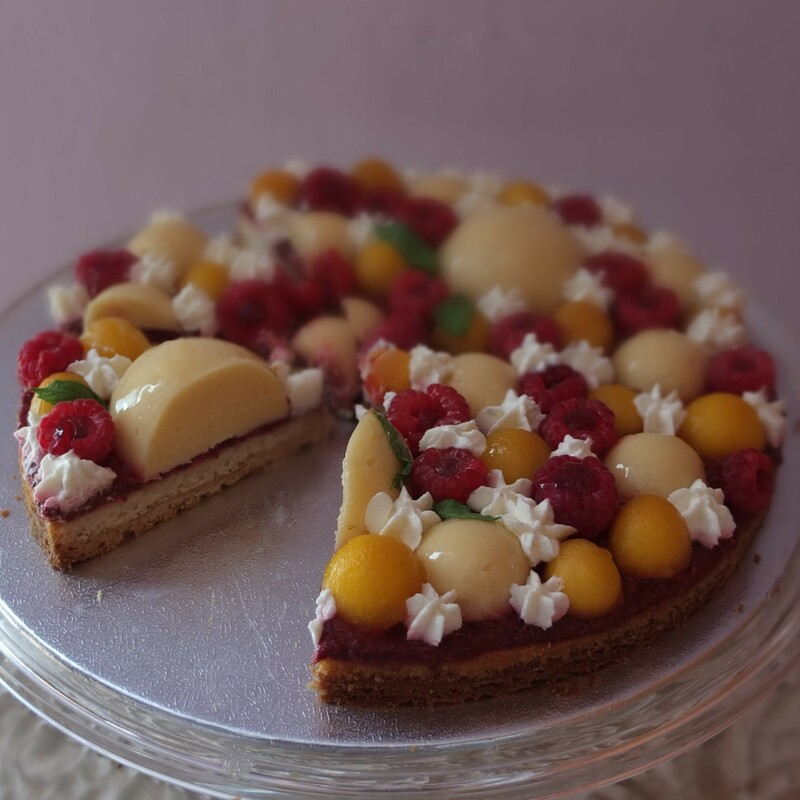 Perhaps you’d like a colourful slice of Fantastik tart à la raspberry, lemon and peach? Or invent your own tarte Fantastik! Any ideas? That looks fabulous! I am drooling on my PC screen again Lili!